*The 2 new rings is tradeable and bank shareable but not resellable. *Players must use the Wedding Ring (Propose) if they’re not married. If married, players may use either Remind or Propose for a Remind Wedding. *Wedding Ring (Remind) cannot be used when not married. ‘Reservation’ function added (characters with invitation can enter first to reserve your seating). Different Wedding Outfit Cubes will be given based on the type of ring used (outfit cubes will be sent to the mailbox). Messages cannot be edited once the Wedding Hall has been reserved. 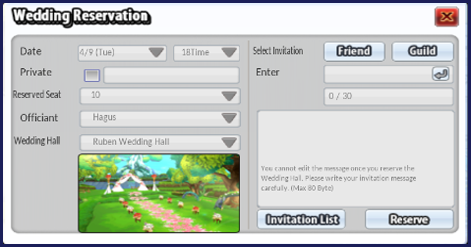 Wedding invitations will not be used if players invite other players using the Wedding Ring. Add more guests using the Wedding Invitation with the Wedding Ring’s invitation Function. 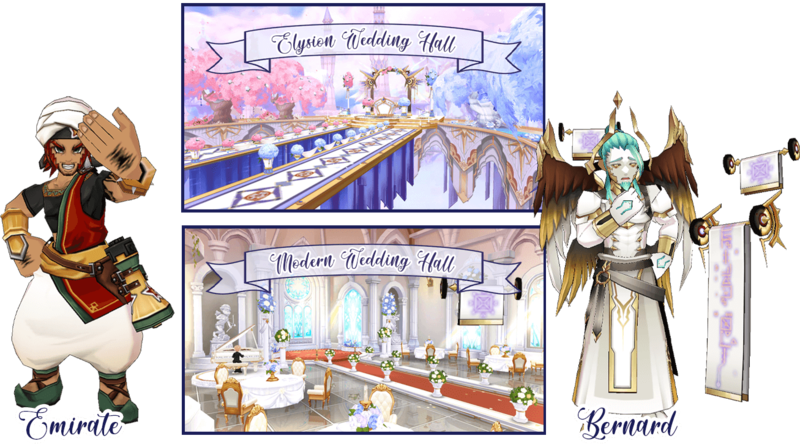 You must first reserve a wedding hall to use the Wedding Invitation (Up to 100 guests can be invited) (Must have the Wedding Reservation Ticket to use this item). If you want to watch a wedding but you’re not invited to any, don’t worry! You can go to public wedding ceremonies, but it’ll be a first-come, first-serve basis! Wedding venues can only hold 30 guests, so if 17 people are invited, only 13 more guests will be able to enter the venue. Make sure you enter on time! Because once the ceremony starts, you won’t be able to enter! Get awesome wedding favors/rewards after the happy wedding ceremony! Plus, wedding anniversary rewards have also been changed! 1. Players can have another wedding ceremony using Remind Propose/Remind even after marriage. a. Players can receive dungeon buffs, titles, and weekly quests again after the Remind Wedding. 3. Existing NPC officiants’ line have been edited. 4. White Tuxedo and Pink Dress’ socket effect will be changed to ‘2% chance to double attack’. 5. [Cobo] Couple’s Ring will be added to the ED Shop. 6. Extremely Heavenly Love tooltip will change. 7. Existing Wedding Packages will no longer be sold. 9. Chibi Mode will be disabled during wedding.